We hope you enjoyed Part 1 of the interview with Jane Pettigrew. We anticipate you’ll now enjoy the final part of this interview, Part 2. Are there any issues the tea industry is facing at the moment? There are a lot of issues at the moment. There’s the whole shifting weather patterns. You know, in the past we used to be able to say the first flush Darjeeling would be made before the end of March/beginning of April. That’s not necessarily so now because the seasons are changing and we’re getting extremes of weather. Now that’s beginning to affect not all producers but some producers are having to think about the long term effects of climate change. Other issues which are facing farmers are things like sustainability, environment – you know, is the Earth going to give up it’s best into the tea plant without some kind of nurturing and care – and that brings us into whether we farm organically or non-organically. These are all big issues. With the consumer, the issues are about organic/non-organic and even bio-dynamic and then the issue of fair trade. I’ve done a survey of various countries around the world who are concerned about fair trade, and in some countries it’s a big issue, and in other countries it’s a tiny issue. It’s something that varies depending on where the teas are coming from. And was that an issue with consumers of tea? Yes. Some consumers might be concerned about fair trade. And a lot of it is about understanding those areas, our perceptions, which teas we drink. But those issues are very very important for the producer and many many producers are now members of fair trade or of the fair trade type schemes. They may not be under the fair trade umbrella but they may actually be working with a body such as the Ethical Tea Partnership here in Britain, which started here in Britain. It was formed in 1997 by a group of the bigger packers and blenders and they wanted to be like fair trade but in competition to fair trade as a tea thing rather than just a trade thing. The producers pay nothing, it’s funded by the packers here, and now it’s in other countries as well, in Europe, in America. And the idea is to track and trace the origins of our teas to make sure that the people we buy from care for their workers, their plantations, in ethical ways. So, Jane, it’s more the end user is demanding this? It’s sort of rather than from the drop to the ripple but from the ripple back to the drop? It’s the ripple back to the drop and I think a lot of people get involved in these schemes because they know it’s what consumers are looking for. I’m not necessarily sure that consumers understand what/ how it works, or where the money goes, or who decides how the money is spent. If they are really interested they will know, but a lot of people think “this is fair trade, I’ve got to buy it”. A guilty conscience is a heavy thing? Does it cost more, for fair trade? My guess is that people are willing to pay more for it, if it is that ‘I am helping a family’, something that I am willing to pay a premium for…and it’s good tea! Yes. Fair trade teas are more expensive to produce because the extra premium on the retail price goes back to the workers in the village. But what a lot of consumers don’t know is that…very quietly without bragging about it, without putting anything on their website about it, without putting anything on their packaging, a lot of people work by giving some of their profits back to the villages where they buy from. So although not under any official scheme, they may have travelled to that village, they know that the locals need a new water tank or a community centre or a football ground or whatever it is and they will actually help over the longer term by giving a percentage back to the village. I think tea had always been a very ethical industry in most of the traditional origins. The specialty tea market is growing all around the world. So people are now, if they don’t buy loose leaf tea, they are buying pyramid gauze [bags] through which you can see the loose leaf tea so there’s an engagement now with the tea leaf, what the tea leaf looks like and with the desire for more understanding and knowledge about the individual tea…where it comes from, how it’s been made, what cultivars are used to produce it, etc…So there’s a lot of interest from that point of view. There is certainly a trend towards organic in some places and fair trade in others, and I think probably the biggest trend is this greater understanding about what tea is. A thirst for knowledge. Tea education is a big trend at the moment. In Argentina, a friend of mine is teaching a tea sommelier course. In America, there’s the Specialty Tea Institute which runs a four tiered training course now through which people learn the most amazing stuff about tea, not just brewing but how it’s made, different origins…everything about it. In Canada there’s a sommelier course going on. In France, I mean, everywhere. People want to understand. So, tea education, on whatever level. And not just for the people who work for the tea company but for the consumer. This is a really big deal at the moment. Jane, do you see tea’s popularity continuing with the newer generations? Or do you think the coffee culture will supersede that? No, I think the coffee culture’s had its day. I know there are coffee bars everywhere. I don’t think it necessarily means we are drinking more coffee. I think it just means people are going out of their homes or out of their offices to go and sit in coffee bars. A lot of coffee bars now do offer tea. Not necessarily brilliant [tea] but they’re getting better. And they’ve become more aware that they have to offer a good tea because you don’t always want coffee. But what we’re seeing now is that if a tea place, a tea bar, a tea venue of any description, does it well, and makes it appeal to all ages and all types, we are seeing a real revolution in the type of people that actually go and drink tea. It used to be a very feminine thing. There are now more men going into business. There are now more young people drinking tea, going out to these kind of places and drinking tea, in groups of friends or to do their homework together or whatever. It depends where you are, it depends on the location, but for example, I’ve got friends in Bristol here in Britain who have a tea place in the part of Bristol where there are lots of youngsters going off to school every day. They’ve got a tea room called ‘Attic Teas’ and ‘Attic’ stands for ‘All The Tea In China’. And they are full of kids every afternoon. They go there on their way home from school with their mums and dads. And they sit drinking tea. So, they are becoming aware of tea in a way that I did when I was a child but on a much more wider scale. They know what the leaf looks like, they know what their favourites are, they can talk to you about tea. There’s one kid who I met there who’s now got his own blog and I think he’s maybe 9/10 [years old]. So I think the new, the younger generation are coming into tea. I think there’s a gap. If you talk to maybe 35 to 40 year olds maybe they don’t drink tea. But the next generation are coming through now. And I think people still love tea parties. You go to any hotel in London and in other big cities around Britain any day of the week you’ll find them packed out. All ages, all types, business people have meetings, people celebrating birthdays, youngsters all dressed up in their pretty frocks, tourists, locals, business people, a complete cross-section. It’s really amazing how it’s just a really big thing at the moment. The debate between loose leaf tea and tea bags: Do you have a preference over one or the other? Personally, I usually use loose leaf tea. I have all of the brewing equipment so it’s really easy for me. But I do understand why people need teabags. I think the catering industry prefers to work with teabags because it’s very easy to block sinks and drains and have an incredible mess with loose leaves. If they set it up it’s a not a problem but most people don’t have the time to do that. So I absolutely understand why teabags are an essential part of anybody’s offering. What most people are now doing is using what we now call the pyramid teabag, the ones you can see through. They are made in gauze fabric. Now, when they were first made they were nylon. Nylon is not good because it’s not biodegradable. So people either use silk or special fabric that is made as a corn starch extract which it looks like nylon. You can see through it but it actually is biodegradable over time. People know what to choose now. Now that option [gives] you the opportunity of packing a quality large leaf tea or herbal, or a blend into those teabags. You can see them, you can choose a quality tea. Where as in the past – I’m not saying teabags are not quality tea – but teabag machinery up to the development of this particular technology meant you had to out smaller particles of tea through the machinery into the bag. Now when you chop tea into tiny particles, possible for it to be packed for teabags, you get a different product. Because as soon as you chop a leaf it breathes very quickly. You extract a lot of tannins, you extract a lot of strength, you don’t necessarily extract the subtly of the flavour. So it’s a very different product. It’s made for a different reason. When you compact a beautiful loose leaf quality tea, you’re going to get the subtle flavour and the layers of flavours that you get from a loose leaf brew in a teapot out into your cups. It’s the way to go. Everybody is really pleased with the way it works. It gives you something beautiful to look at and you can brand it with your name on the tag. It’s fine for a smart catering situation. It’s fine for home use. They are four times the price of a paper teabag. But, you know, as people have begun to recognise that tea should not just be a cheap commodity [then] they don’t mind paying a little bit more for it. 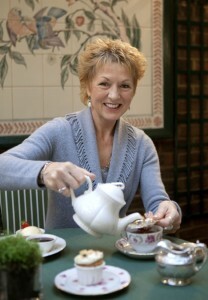 And certainly in the catering industry – for anybody who cares about the tea they’re serving – it’s an absolute asset. So, for me, I would always choose a loose leaf tea if I can. But if I can’t then I would choose a gauze teabag. I would say in most cases where it’s just the teabag on offer I wouldn’t choose to drink it. Because very often they are quite disappointing, they are being served in an establishment that doesn’t understand tea, and doesn’t understand brewing. And therefore you’ll get a pretty unpleasant cup of tea out of it. I would rather have water or juice, or, you know, a latte! [laughter]. It depends on the teabag. It’s wrong to say all teabags are bad because some teabags are very well blended, very well packed, they’re very good, they meet certain needs. But if you want to drink specialty teas, the way to go is loose leaf or the pyramid teabags. Last question, what has been your favourite place to drink tea in the world? Oh boy, that’s difficult. I’ve been to so many amazing places. One of my favourite places is at the top of a mountain in Taiwan, at an organic tea plantation run by monks, Buddhist monks. They took me around, they were just amazing. But they’ve created their own tea ceremony, and they have combined, you know, the Chinese tea ceremony with the Taiwanese tea ceremony (it usually just involves the tea and maybe some little sesame seed snacks or something). But they actually combined the fact that the tea plant grows above the ground and they’ve taken peanuts that grow below the ground and brought the two together in the ceremony. And they roast the peanuts. It’s in the ceremony whilst the tea brewers are brewing the tea. And then you get served both together. It’s done with the same ceremony that the Chinese ceremony is always performed with a little bit of Buddhist music in the background. A lot of beautiful gestures with the hands, a lot of implements being used and that was amazing: We sat in this fabulous room that was all decked out with Buddhist hangings and an altar, having this wonderful ceremony. Then we sat in the court looking out over the valley, chatting about their tea, life there at the top of the mountain, and the mountain opposite them looked like a Buddha Sleeping! So, it’s a really special place. We were up to about 6,500 – 7,000 feet. It was wonderful. But I could cite to you many places: With my family and friends who make Pu-reh tea, sitting there in their beautiful house with the mother brewing tea that they have made for us with all the ceremony: The pots and the dishes and the bowls. Um, just so many places where I’ve drunk tea that are very very special, very memorable. It’s hard to pick one.